I’m very excited to be talking to Dr. Trevor Cates today because I have been doing a lot of reflection the past few months about the realistic ideas are for a lot of people in this industry. So many of us are so impatient when it comes to building our business, paying off our debt, and getting patients into our office. If it doesn’t happen fast enough we tend to blame outward issues such as associations aren’t promoting us enough, people aren’t referring me enough, or my clinic owner isn’t putting out my information enough, etc. Rarely do I hear people bringing that inward to ask themselves, what am I doing to benefit from my practice? After having my last talk with Lori Kennedy, that was something that really hit home for me. You may think the ideal for your business may be to hit 6 figures, or half a million dollars a year might feel successful for you, or maybe having a better net gross is more important to you, or only working 2 days a week, etc. Today we’re going to be talking about creating realistic expectations and potentially reducing what your desire is or ultimate goal for your business is, based on what you’re willing and not willing to give up in your life. Today, we’ll be discussing these things with Dr. Trevor Cates. 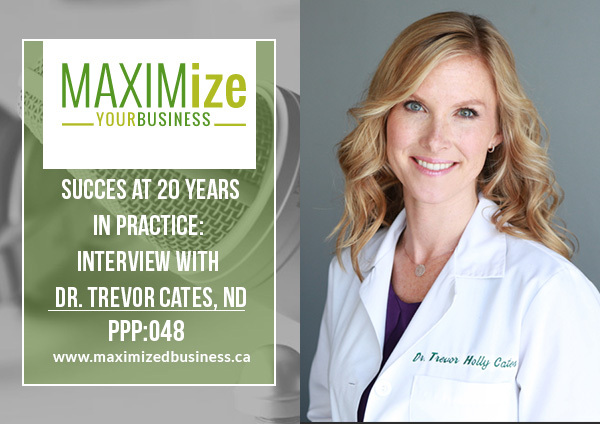 Dr. Trevor Cates is a nationally recognized naturopathic doctor. She is also known, as “The Spa Dr.,” and was the first woman licensed as a naturopathic doctor in the state of California, appointed by former Governor Arnold Schwarzenegger to California’s Bureau of Naturopathic Medicine Advisory Council. She has worked with world-renown spas and sees patients in her private practice in Park City, Utah with a focus on graceful aging and glowing skin. She has been featured on The Doctors, Extra, First for Women, Mind Body Green and is the host of THE SPA DR. Podcast. Dr. Cates believes the key to healthy skin is inner and outer nourishment with non-toxic ingredients. Her new book Clean Skin from Within will be released in March 2017. Dr. Cates’ The Spa Dr. skin care and supplement lines are formulated with natural and organic ingredients designed to help you achieve the clean and natural path to confidence and beautiful skin. How did you build and sustain your list? How do you manage to build your tribe without getting overwhelmed? What are some of the struggles you’ve faced in growing your business? Why Trevor decided to write her book. How she got into naturopathic medicine. Where Trevor sees opportunities to open up to her patients. What Trevor does to get her message out to people. Why you need to focus your goals before you can grow your audience.